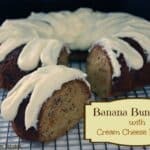 Banana Bundt Cake covered with delicious Cream Cheese Frosting is a fun spin on traditional banana bread. 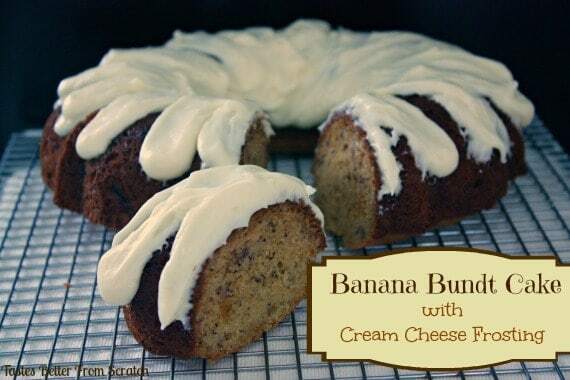 This is a great moist and flavorful cake with sweet banana flavor. Nothing beats a classic cream cheese frosting on a cake like this! Is it dessert, or is it breakfast? I’d say BOTH! Preheat oven to 350 degrees F. Grease well or Butter and flour your bundt pan. In a separate bowl, beat the butter and brown sugar until light and fluffy. Beat in the eggs and vanilla. Mix in the buttermilk and mashed bananas. Slowly add the dry ingredients, stirring gently, just until fully incorporated. Pour into the prepared bundt pan and bake for 40-45 minutes or until a toothpick inserted comes out clean. Allow to cool for about 30 minutes before inverting it out of the pan. Frost with cream cheese frosting. Cream butter and cream cheese together. Add Confectioners sugar and milk and beat until smooth. Great recipe!!! My whole family loved it!